Friends of Nant Fawr Community Woodlands: About Us! Why "The Friends of Nant Fawr"? The Nant Fawr Community Woodland was established in 1993, and forms an important part of the green corridor along the Nant Fawr stream, connecting the centre of Cardiff with the countryside to the North of the City. The land is owned by Cardiff County Council, and managed by 'The Friends of Nant Fawr': local residents who are interested in nature conservation and value this beautiful area. The Friends organise practical workdays each month, performing tasks such as path laying, stream clearing, and coppicing. Other events include natural history rambles, and talks on related topics. The North-eastern section of the community woodland consists of three ancient meadows which once formed a part of Rhyd-y-blewyn farm. Each of these has different ecological characteristics, and different communities of plants and wild-flowers. Since 1993 these meadows have been managed in a traditional way by allowing the wild flowers to bloom and seed before cutting and removing the hay in August. This removal is important as it reduces the nutrient content of the soil and encourages the growth of wild flowers rather than grass. Consequently the flower populations are increasing, as well as the numbers of insects such as butterflies that feed on them. Congratulations to Ivor Lippett, who has recently been awarded a British Empire Medal for services to the community. 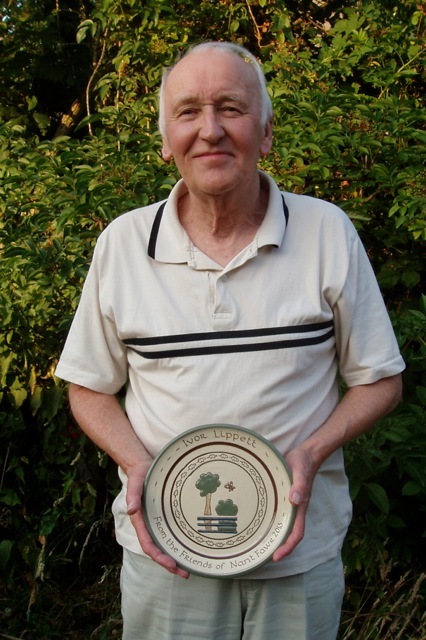 In addition, Ivor has been awarded a commemorative plate by the Friends of Nant Fawr in appreciation of the work which he has done over the last eighteen years to support the Friends. We are all glad that Ivor has regained his good health and hope to see him at our workdays for many years to come.